I came across the title of this novel on a blog somewhere. Actually, it was only mentioned in passing, but I liked its title immensely so I checked what the novel was about, and then, convinced, I jotted down the author and the title on a slip of paper and put it away to a place where I was surely going to find it later. Of course I didn’t find it when I needed it, so I tried to track down the book again based on what I could remember about it. Unfortunately all I could remember was that it was written by an English author, it had a very enticing title, and its protagonist was an obese woman who had a crash on her neighbor. It’s hardly surprising then that I was unable to find the book based on so little information, and I was on the verge of panic when my precious slip of paper surfaced from a heap of similar slips of paper, and I could finally order the novel. After so much excitement and relentless research I certainly expected A Kind of Intimacy to be a good book, and it proved to be one. The novel starts out with the clumsy, unbalanced protagonist, Annie moving to a lovely little street somewhere in suburbia with the intention of leaving behind a troubled past and starting a new life. Right on her first day in her new home, she meets Neil, a nice guy living next door, who offers to help Annie carry her belongings to her new house. Annie immediately takes a liking to Neil, and even though she is well into her twenties, she quickly proves that her imagination is that of an inexperienced teenage girl, and after a very short time she gets as far as seeing a sign in Neil’s every little gesture, and she even manages to convince herself that there’s a special bond between them, and that it’s only because of the cruelty of the outside world (more precisely: because of Neil’s girlfriend, Lucy) that they cannot fulfill their love. Of course, Annie doesn’t spend all her time dreaming about Neil – she really attempts to start a new life. She tries to find her place in the local community; she organizes a housewarming party; and she joins the local neighborhood watch organization. But somehow everything turns out badly: the local community isn’t too eager to welcome her; virtually no-one attends her party; and as regards the neighborhood watch, Annie interprets this expression in a rather special way, and she watches her neighbors even when there’s clearly no need for it. After the bad start, things change for the worse, but I’d rather not go into any more details. 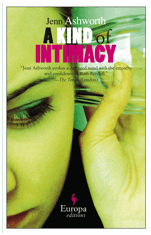 A Kind of Intimacy is en exceedingly scary book. The blurb of my copy (apart from revealing virtually every important detail of the plot) mentions that in the novel, we can see how Annie’s carefully constructed ego, maintained by self-help books, slowly decomposes, and the true Annie surfaces from behind her mask. Perhaps this is only meant to imply that the other characters in the novel are for some time deceived by Annie, because for the reader it is clear from the very beginning that all is not well with Annie. Right on the very first page we find an account of how Annie celebrates her moving to another house. She strips her clothes, then starts kicking her sofa she always hated with wild joy, because she’s so happy that she can finally leave the detested object behind. I guess this is not the typical way of celebration, but if we still have our doubts about the true meaning of Annie’s behavior, we will soon find other pieces of evidence proving that Annie is not in the best of mental health. So, what makes the novel so scary? For instance, the fact that Annie tells her story in the first person, therefore we experience everything she experiences: from her recollections we learn how she lived through her teenage years, we see her early marriage, the birth of her unplanned and undesired daughter, and the period after moving to her new home when she tried to do everything in order to finally make herself accepted and find friends. Of course we can laugh at Annie’s childish efforts to please everyone (and the first half of the novel is indeed quite entertaining), or we can be annoyed by the way she casually ignores a lot of rules which help keep a marriage or a local community together, but then all this ceases to be entertaining when we realize that in fact Annie isn’t a cynical but clumsy person nurturing all kinds of evil plans, and that some parts of her actions we might consider self-ironic are in fact done absolutely in earnest. The world for Annie is just the way she sees it. And when she explains that she clings to the wall of her bathroom with her ear because she wants to cool her face with the cold tiles, and then casually adds that this way she can hear the conversation going on at the other side of the wall, in Neil’s and Lucy’s bathroom better, then it seems that she truly means that she only wants to cool off, and eavesdropping only comes as an extra. Or what’s worse: it happens that certain small things slip from Annie’s memories, and when she says she doesn’t remember holding anything in her hands when she poked another character in order to make her meaning come true more emphatically, then she’s not trying to come up with cheap excuses, she’s not being cunning, she simply doesn’t remember. And for me it’s an extremely strange and embarrassing experience to go this deep into such a disturbed and dangerous but in some ways totally innocent mind. Even more so because I often feel Annie very close to me, I often feel with her and can understand what she does and why she does it. A Kind of Intimacy, by the way, reminds me of several other books and movies, but of course it’s not an imitation of any of them. For instance, on the book cover one critic mentions that Annie strongly resembles Annie in Stephen King’s Misery, and the resemblance is indeed striking (and it doesn’t end with both heroines bearing the same name). Apart from this, Ian McEwan’s Enduring Love and Anthony Burgess’s One Hand Clapping often came to my mind while reading this novel, and I was also reminded of a movie of the 1990s, Pacific Heights, which I saw some ten years ago, and don’t really remember anymore, but the atmosphere of Ashworth’s novel still evoked in me the terror and helplessness I felt when I watched that movie.